Successfully Added LED Headlight Bulbs - Type H8, H9, H11, High Speed Cooling Fan, 72W, 7200LM, IP68, 200m Range, 6000K Color Temperature to your Shopping Cart. With these LED headlights for your car, you’ll be able to light up the road in front of you and never be caught in the dark again while driving those countryside and forest roads at night. 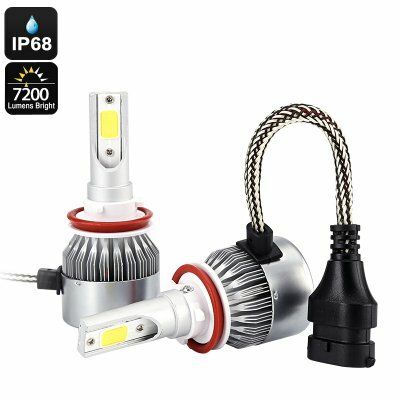 Suitable for cars that feature a type H8, H9, H11 light interface – these LED headlight bulbs can be used with a wide range of vehicles out there. Although small and compact in design, these powerful LED car headlights are capable of producing up to 7200 Lumen. Thanks to all this power, these car light bulbs will light up the way up to a distance of 200m in front of you. From now on you’ll be able to head out driving your car after dark with confidence as these LED car headlights will make you feel as if you are driving in plain daylight no matter the time of the day. Thanks to their intergraded cooling fan system, these LED car lights stay cool at any time. Supporting up to 5000 hours of service life, these lights can be used for multiple years in a row without you needing to worry about replacements. They furthermore feature a tough and IP68 waterproof design. Thanks to this, these LED headlight bulbs are resistant to water, shocks, and dust – allowing them to work no matter the weather conditions or environment. For those of you that are looking for a new pair of LED car headlights, this car bulb set is the ultimate choice. Compact, tough, and powerful – these LED headlight bulbs will light up the path in front of you for years to come.